I'm a 30 year old computer programmer and live my partner in Rochester, Kent. I comfort ate my way through university gaining about 7 stone in the 3 years. I lost 5st70lbs31.7kg stone in just over 7 months and am still aiming to lose a little more in the next year, and to continue toning up. To be honest I never really knew how big I had got, I'd shy away from having any pictures taken and I didn't have a full size mirror at home. It finally dawned on me when I had to order some new clothing for a business trip to Asia. I found I couldn't fit into any clothes from high street stores, let alone designer brands. I was forced to order from "Jacamo" and I could only just about fit into size XXL! On my last day in Asia there was a group picture and after not seeing myself for so many years, I was shocked at my appearance. I think that's when I knew I had to do something. How did you feel about yourself and your health before? I was certainly on my way to diabetes,was suffering from high blood pressure and I was very overweight with a BMI of 34 - well into the obese rating. I was struggling getting off the sofa, I couldn't walk for long without needing to stop for a breather, and my asthma was making a come back too. Any exercise I tried was met with me feeling very light headed and almost fainting. Mentally my weight was seriously affecting my confidence and I really did hate the way I looked but I did all I could to just ignore it. I firstly tried to just remove the sugars out of my diet which to be honest didn't really do anything! I also tried the smartphone app "MyFitnessPal" but I found it was far too easy to forget my phone one day and quickly slip back to bad habits. But no formal diet other than Nutracheck. Why did you choose to join Nutracheck? I really didn't want to go to weight loss meetings as I was far too self-conscious, I just wanted to hide from the world and do this journey on my own. A work colleague had been using Nutracheck and suggested I try it as it may firstly help me identify my "bad habits" to help me lose weight. 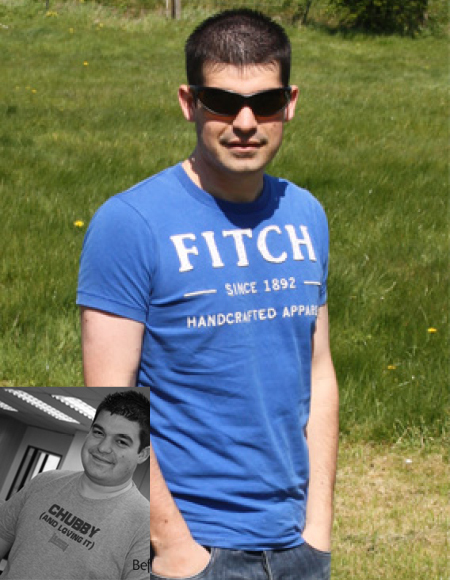 After losing half a stone in the first week's free trial I signed up without thinking twice! It quickly become apparent that I had no idea what I was eating and I really was eating absolute rubbish. It also showed me that I had little idea about how many calories were in foods. Therefore it's really helped educate me into selecting the right foods for the right nutritional value. I did hit a couple but they were mainly times when I knew I was being a bit lazy or around birthdays, for example. To overcome these, all I did was reduce my intake and did a little more exercise, not to mention heading to the forum first looking for a shoulder to cry on! It can take time to overcome these though and you need to just battle on and you will come through it. I think my longest was about 3 weeks, but after I got past that, I just lost weight like it never happened! What has kept you going and focused? What are the biggest changes you've made? My eating habits have completely changed. I don't like the taste of sugary foods now so I don't eat them. I don't eat takeaways as I really don't like the taste, I'd rather cook meals myself now - at least I know what's in them. I don't binge eat and I only eat when I'm hungry so I don't need to comfort eat! A flat stomach is much more of a comfort than eating! I've also been able to change my clothing style, I'm now able to shop in designer stores and fit into most designer clothing. I even have some "small" sizes in my wardrobe and I cancelled my "Jacamo" subscription many months ago! In the middle of the diet I stuck strictly to burning 250 calories on my exercise bike six days a week. As I got closer to my target I reduced my exercise levels to 3 days but I also started going to the gym once a week to vary my exercise patterns. I also used dumbbells most days from the very beginning as a means to tone up. Whilst on the diet I was weighing up to once a day as I believe it helped me to confirm that I was eating the right things. Now I weigh once a week on my weigh-in day which is always the morning of my day off. What difference has losing weight had on your life - what do you do now that you didn't do before? It's improved my confidence beyond what I can explain. Before losing weight I just wanted to hide away from people, now I'm proud with my new look. I'm also far more active and I can walk for miles now. I'm looking forward to doing more sports in the summer months. How have your friends and family reacted to your weight loss? My family have all been brilliant, my partner has lost over a stone just from me changing my cooking style and it's improved our relationship. Friends have been really supportive, some are even a bit jealous! I've even had friends walk past me who haven't seen me for a long time because they don't recognise me! Do you have a goal in mind of something you are going to do now you've lost weight? We are aiming on going on our first summer holiday for years to Greece in the summer. I'm looking forward to removing my t-shirt for the first time in many years and not being ashamed. I'm also looking forward to getting a good tan! What are your top tips for staying on track with your diet? Stop drinking! There's an insane amount of calories in alcohol. If you can stop drinking then you really have more chances with losing weight. Do your grocery shopping online so you can't be tempted and don't buy treats! If they aren't in the cupboards you can't have them. But make sure you have fruit and the odd healthy treat so if you do have spare calories left over you can at least snack on something. I always have grapes at home (the new Haribo!). Weigh all your cereals and cooking ingredients. It removes the guessing and makes using the diary so much easier, in time you will do it without thinking! Use the "Day off" setting to give yourself a day off over the weekend. It makes the ride much easier and the motivation midweek knowing you can have a treat at the weekend is a huge plus. We use the day off to go out and eat in a restaurant because it's something we used to do and it's still nice to get out without having to worry about cooking. It also allows me to continue enjoying food. But I still stick to my targets though and I still log the calories. Do exercise; it makes the weight fall off quicker. You see so many people on the forums saying they don't exercise but they take the 200 calories off the intake allowance. I never did this, I'd rather spend 20 minutes on the exercise bike and have 200 more calories to eat. If you don't want to go to the gym then don't! I got myself a really cool exercise bike from eBay which is just like the gym ones so it's like having the gym at home. Be honest with your food diary, it's there for you! Log everything even if it's only a few calories. You will learn from your mistakes, but you can only learn if you know about them. Use the forums for advice and as a pick me up. There are lots of brilliant people and everyone's certainly been there before so someone will be able to help!